A resolution to request UN Human Rights Council to establish a special court in Sri Lanka to probe cases related to war crimes and human right violations in the North during the war, has been passed at the Northern Provincial Council (NPC). 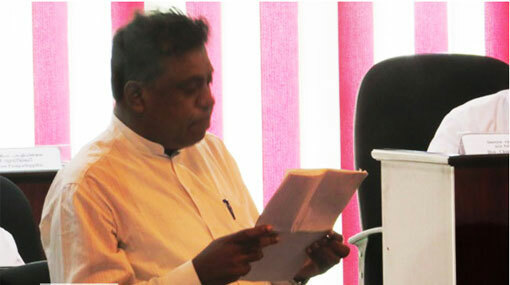 The Tamil National Alliance (TNA) representatives of the Provincial Council have unanimously approved the resolution yesterday (30) during the 130th session of NPC held in Kaithady, Jaffna at the PC premises. Accordingly, the resolution, proposed by NPC member M.K. Sivajilingam, will be requesting the UNHRC to establish a special court in Sri Lanka under the International Criminal Court or international supervision. Responding to queries regarding the resolution, M.K. Sivajilingam stated that Sri Lankan government has not conducted any kind of an inspection regarding the human rights violations and war crimes towards the people in North by the military forces of the country. He added that this resolution was proposed again to the NPC, as the government had failed to conduct investigations into the war crimes as promised at the UNHRC. The government has not taken any measures to do justice to Tamil people who lost their lives due to the war, and international intervention should be rendered to find solutions for issues including releasing Tamil political prisoners, searching for the disappeared persons and security forces not releasing the lands of Tamil people, M.K. Sivajilingam stated. Through the resolution, he requests for the appointment of a permanent representative of UN to probe war crimes and human right violations in the North. Further commenting, he said that, although the incumbent government came into power promising to do justice to the people in the North, it has failed to as promised. NPC member M.K. Sivajilingam said government has also failed to provide a political solution to people in Northern and Eastern provinces. Hence, he has requested that the government should provide a political solution through a referendum for the relevant issues, with the participation of people in North and East.